With the announcement of iPhone 6 it is expected that the Gold Master edition of iOS 8 will be released to developers and a final version of the update will be pushed to all users soon afterwards. iOS 8 is a major release that brings several new features to the operating system. While most users are waiting for its release they are also wondering when will hackers be able to release an iOS 8 jailbreak for current and new Apple devices. In these uncertain times a Redditor has released a few images that allegedly show an iOS 8 jailbreak through the Pangu tool. The images do not show Cydia running on the iPhone however they do show Pangu detecting iOS 8 device and Pangu icon on its homescreen. Unfortunately the Redditor has not provided any hard evidence other than two images that can easily be faked. The title of his Reddit post reads “Pangu reverse engineered for iOS 8” and that’s all he has to say about it. In the shared images the Pangu tool is shown running. In the first image above you can see the tool running on a Mac, which is running OS X Yosemite judging by the UI. If you look closely you can see “iPhone 6,2 with iOS 8.0 (12A4345d)”, which indicates that the connected device is iPhone 5s and it is running iOS 8.0. 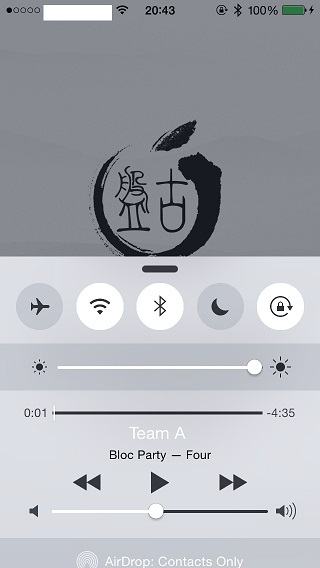 The second image, which is an iOS screenshot shows iOS 8’s redesigned Control Center with the Pangu app in the background. If you have ever jailbroken an iOS device using Pangu then you will know that this icon appears during the jailbreak process. While we are certainly not believing these images until the person behind these images comes up with hard evidence such as a video, however if he has really been able to reverse engineer Pangu to support iOS 8 then it is certainly an exciting news for those who want to upgrade to the latest version and still be able to jailbreak their device.